The next day we decided to return to the the Curry Hammock cove. I was eager to get out for a long walk and Matt thought the rocky beach looked like the perfect spot for patching a small but persistent leak that had been bugging him. Pulling into the cove with full sun was even more beautiful than the night before. The mangroves lining the cove were revealed to be Red Mangroves, with dazzlingly green leaves, and the water was crystal clear, revealing a large school of tarpon rolling in the depths and lobsters lurking along the edge of the drop off, both of which made Matt drool. The shore line was also not rock as we had thought, but the remnants of a fossilized coral reef set upon a bed of limestone. Though we haven't been able to verify it, we think the big blue hole by the trail may have been an old limestone quarry, similar to the famed Blue Hole located on Big Pine Key. Demand for limestone increased in the keys in the early 1900's, when Henry Flagler began construction on the Over-Sea Railroad, which he intended to extend all the way down to Key West. During this time, so much limestone was available that it could be taken from just about anywhere, causing quarries to suddenly pop up all over. 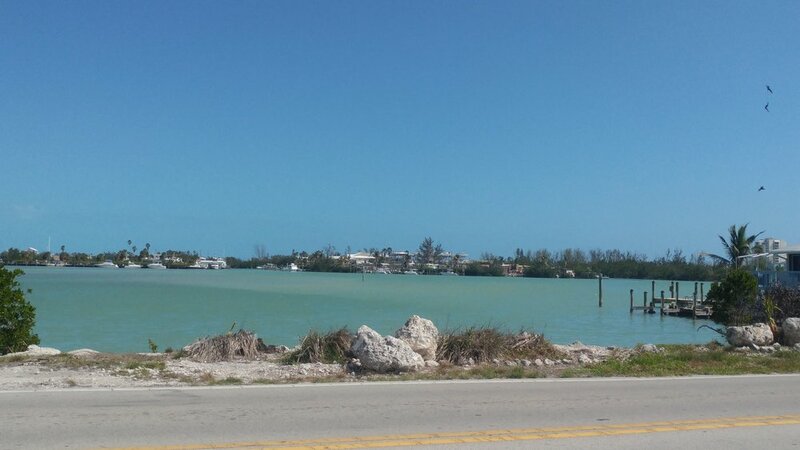 As a result, there are many seemingly random blue holes that mark the coastlines of the Keys. Most of these old mines have since been converted into marinas, but some still sit as remnants of an earlier time. The feat took years to finish and an unimaginable amount of resources, but it was completed in 1912. While the railroad helped trade in the Keys flourish, leading to a slight increase in its population, the trip was still too cumbersome and unpleasant for tourists, and the dream that a railroad would lead to a boom in a yet untapped tourism industry never came true. Despite this, the Keys did well economically throughout much of the 20's, Monroe County even began constructing a road to parallel the railroad at this time. But this momentary influx of wealth was not enough to shield them from the devastating blows of the Great Depression, which destroyed both the cigar and sponging industry of the keys. Poverty was such an issue in the Keys during this time, that government assistance was required. The Federal Emergency Relief Administration stepped in and commenced an aggressive marketing campaign promoting the Keys and increasing tourism. At the same time, government efforts were placed in developing the road connecting the Keys, rather than fixing the aging tracks. Finally, in 1935, a category 5 hurricane all but destroyed most of Flagler's railroad. The ensuing financial difficulties made rebuilding it impossible and it was purchased by the county's Overseas Road and Toll Commission which converted the bridges for automobiles, opening it up for traffic in 1938. In an ironic way, it seems fitting that limestone, a structure so vital to the formation of the keys would be equally essential for the development of the modern keys, via the Flagler railway, which brought trade and settlers to the region and laid the foundation that would make the Keys more accessible. Today, all that remains of the ancient limestone reefs and the railroad, both once unfathomable wonders of man and nature respectively, are their skeletal support structures. Stolidly weathering the effects of time, having been left behind as obsolete, their remnants now only stand as curiosities and places to fish. These were the thoughts that crossed my mind as I walked along the Heritage trail to the outskirts of Marathon. Once out of the park boundaries, rather than tall mangrove trees, I was surrounded by the bustle of life that defines much of Marathon's main streets. Much of the city still bore signs of the destruction brought by Hurricane Irma. Billboards, if they weren't still lying on the ground, stood naked and barren of ads. Many roofs still had tarps pulled across holes that had yet to be fixed and other general debris lined the sidewalks and roads. Large restaurants and chain hotels were more or less repaired and stood immaculate among what were likely locally owned businesses. Despite the broken roofs, fallen trees and other signs of destruction, I could still feel a languid feeling of bliss and an easy-going, island vibe that is so pervasive throughout the Keys. It's a feeling difficult to describe, but a sign I saw, still standing and baring no signs of destruction, said it perfectly: “Honestly now. What's your hurry? You're here.” One thing that is certain of Florida, come Hell or the high water that inevitably reaches us, for better or worse, it will always be Florida. And The Keys will always be The Keys. Until the day comes that all the islands sink under water, nothing will change that. After my long and hot walk, I returned to the shoreline with Matt. As we waited for the dinghy's paint to dry, we walked deeper into the small trail that ran next to our spot. While we didn't walk its entirety, the small part we did explore was cool and jungle-like. Small patches of fossilized coral would peek through the soil, as only a thin layer of dirt had settled on the ground. This thin layer was just enough to offer a sturdy foundation for Mangroves, Gumbo Limbo, Mahogany and other tropical trees that surrounded the trail both from above and on the sides. We were even lucky enough to spot an adorable native Green Anole, whose lime green skin stood out against the dark wood of the trees. When we returned to the dinghy, we sat a bit longer, admiring the turquoise, clear water and the fish that would occasionally break the surface. We will definitely return on our way back to more thoroughly explore the area and fish for some Tarpon. I couldn't wait that long to swim however, and when we returned to the boat I quickly jumped in the water. The water around our boat was wonderfully clear and comfortably cool. It was nice after looking at water for so long, to finally get in it. The water and weather was too perfect not to swim. I hoped to see another sea turtle, but settled for the lovely sea beds. A sweet cairn on the Curry Hammock Nature Trail, made mostly of fossilized coral. There was also some sea glass on the top. A beautiful Green Anole. 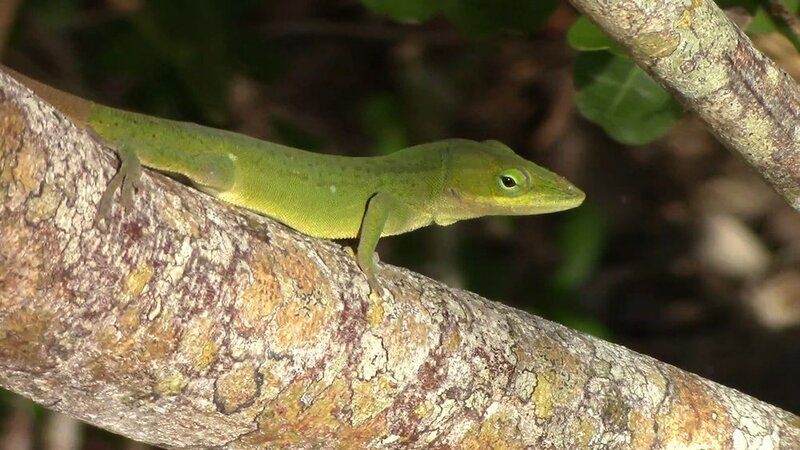 They are native to Florida, but have been pushed out mostly by the non-native Cuban Anole that are more commonly seen. The water by the blue hole on the Curry Hammock Nature Trail was absolutely wonderful and crystal clear. We had a large, orange Iguana hanging nearby, strutting his stuff. A cute little Hermit Crab has the perfect camoflauge. You can see how the fossilized coral shelf just drops off into the hole. A little bit of Curry Hammock Nature Trail. A little Cormorant hanging out by The Quay in Marathon. The water was so blue and clear, you could see his little feet in the water. The Island Fish Company has a helipad and helicopter. Because when I think restaurant, I think helicopter tours. Only in the Keys. One of the many locally owned businesses that haven't completely bounced back from Irma. My favorite sign so far. Gotta love that blue water. Every dock has its birds.